← Should I Spend Donuts On Peek-At-Em Park? 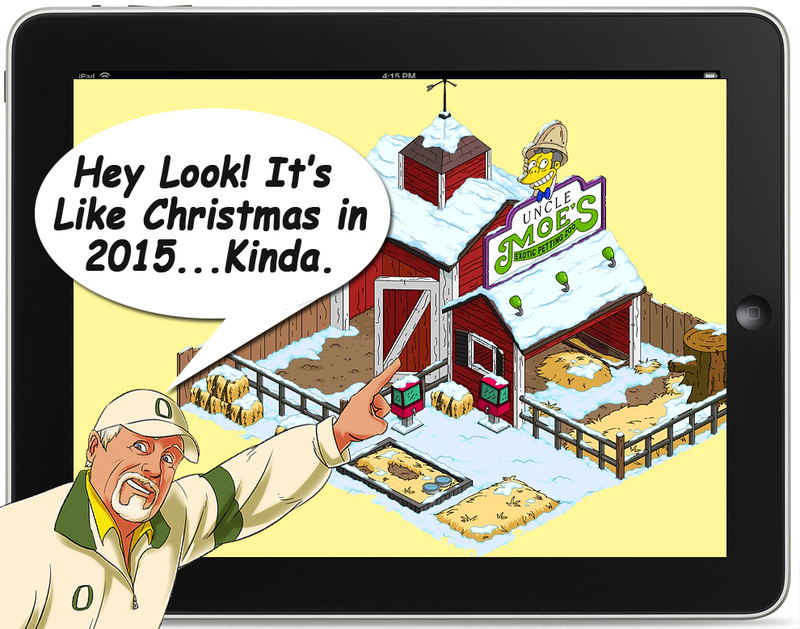 If you played the the “Christmas/Winter/Solstace” (it was convoluted) update in December 2015, then you likely already have “Moe’s Petting Zoo” in your Springfield. So this entire event, may feel a bit like, “We’ve done this before.” Because, we have…kinda. But, in many respects, I’m going to have to say that like it or not (I’m not a huge fan), EA is listening to us once again, at least about a handful of things that we were complaining about. In this case, it’s not so much the content, as the way they played their hand(s) at placating some of the problems. So…some of the Big Stuff that we were complaining about were dealt with in one big punch of the “Update” key. I tested this by placing a TON of my small monorail tracks…then counted. This is an estimate…but I think it is accurate. Anyone else have a guess? They gave us a HUGE chunk of land..which was automatically imbued with the “magic multiplier zone” so we didn’t have to guess. (Chillax on earning the 2% multiplier…it comes in good time…and is hardly worth the trouble. It’s 2% not 20%!!! Crafting is kinda dead…but they added a new thing to fester about…the “earning of upgrades” (like the original Moe’s Petting Zoo). It’s not really worth festering about (unlike me using the word festering twice in one paragraph…or maybe three times to be precise). But, there were also a TON of little changes that came with this update that were fixes, and improvements, proving once again that EA is at least TRYING to get things right. A new music has been added in the background. (didn’t notice, because I have the music turned off in my control panel). A system message was added making note of the button that was added to Injury 500, Log Ride and Zoominator to turn ride animations on/off. (this is a cool feature that Alissa wrote about earlier…apparently…but I missed the post and the change until they told me about it). Norbert’s Listen to Grampa Babble job was fixed. A new Character group was added, Wiggum Family: Wiggum, Ralph and Sarah Wiggum. (SO YES…WE ARE GOING TO GET SARAH). Bart’s Treehouse requirements were changed back. Allison Taylor, Boittany Brockman, T-Rex and Tennage Homer can now Bounce on the Moonbounce. Youngsters’ Watch Poochie Ironically job was removed. (That IS ironic). Deluxe Condo, Valet Parkin, Business Center, Classic Mansion, Modern Mansion and Private Island’s Bonus XP now applies to $ too. (WHOA!!!!!!! SO THAT’S WHERE THE EXTRA % Came From! !…no longer hidden). Moe’s Cavern build time is now 6s instead of 4h. Sophie Krustofsky is now premium. Wiggum House is now visible in the store also by starting Family Fun Pt. 1. (It’s about time…now the Wiggum House can be “complete with Mom!). 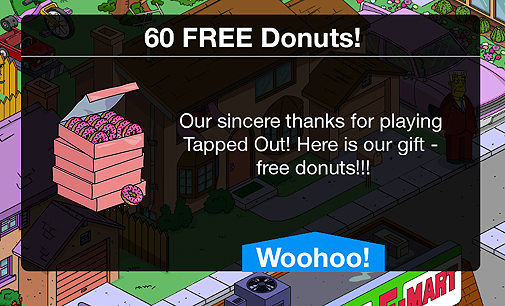 60 FREE DONUTS as a “Thank You” from EA!!! OK…that last one is cool…they didn’t have to do it. But, I suspect, it is also a way to help offset some of the inflated prices that we are seeing in this update. While the “Day Old Donuts” Gil Offer is one way to lure actual donut buyers, farmers won’t care at all. But, 60 donuts will help offset the cost of Sarah…who won’t be available until the 17th…and is 300 donuts…ERGH! At least they didn’t force us to buy donuts to get her. All in all, while I am not a huge fan of another gigantic portion of my Springfield being dedicated to a Family Amusement area (the total size of ItchyScratchyKrustyZooLand is now roughly the size of the original “Springfield Proper), at least they didn’t make us use Land Tokens to get it. So…How Much is Too Much when it comes to a zoo? Hard to say, really. What I do know, is that I moved my Moe’s Petting Zoo over to this area…and with just a handful of spare items left before I max out again, I’m not inclined to “pretty it up,” much. Until they give us a real increase in items(at least another 1,000)…everything is going to be done, “on the cheap,” (which seems to go along with the event dialogue). Dirt paths…sparse decorations…just grinding through to get it finished. Which leads me to my favorite thing about this update…which none of you saw. It was a line in the “Preview” we got from EA. Have a great weekend! Grind if you must… or actually take the time to get outside and go to a REAL zoo! What is your favorite zoo experience? Do you have one in your home town? This entry was posted in Friday Filler, Tapped Out and tagged Moe's Ark Act 1, Moe's Ark Update, Moe's Petting Zoo, Tapped Out Tips and Tricks, The Simpsons, The Simpsons Tapped Out, TSTO, TSTO Addicts, TSTO Community, TSTO Tips & Tricks, TSTO Tips and Tricks. Bookmark the permalink. I’m not even going to try making this Zoo take up any space beyond the Bonus Zone, but I’m glad Crafting is gone. 60 free Donuts is appreciated, this doesn’t feel like a Grind every 4 Hours (I’m easily 2 days ahead of the Act 1 Calendar without even trying). I can still Kem Farm (yes my Springfield Bonus % went up an extra 180 – thank you, EA) …. but I’m not spending Sprinkles until Sarah Wiggum is available (and I may stop doing this Event after that in order to Kem Farm for Halloween and Christmas). The music for this event – liking it! Anyone know more info on the music, like title, composer, or such?? That is an interesting question…I am going to see if I can find out, as soundtrack music used to be part of my took box. but to me, it sounds more like Danny Elfman than Alf Clausen. It is fun and enchanting…kind of a benchmark of Elfman. Your husband has great taste. I have loved his work since he started doing soundtracks. Very talented…and he and Tim Burton are perfectly matched. But he has also done great work with other directors as well. I actually have a handful of his soundtrack albums… but this piece is still eluding me! Speaking of item limits, do roads count against the item limit? My favorite zoo is the Bronx zoo as it’s in my hometown. My favorite book about zoos is “the lady and the panda” by Vicki croke. It tells the biography of the first panda in the United States that was brought into the country by a woman. I’m trying to figure a way to make the “Bug Building” into something more than a nondescript square box of a building…and I got nothing. Sooo…I go visit a few of my more prolific neighbors, and two of them have come up with such great designs (which I will “borrow” from, no question😏) that I want you all to see them. This sure keeps me humble…Kyle(Lisa) and Nick, take a bow! Wow! Did I just get an honorable mention? Truly flattered😁 So glad you like my designs. My fiancé told me that they’ve been doing that on Mexico for years. Lol. Unbelievable! There was a zoo in China that would try to pass off dogs as lions. Well, a proper zoo area is different and kinda fun. Animated animals, fun sounds, lots of decent free stuff – paying for or crafting wall and road pieces anyone? That war of the playgrounds gave me yet more battle zones….only this time ones that are pretty useless after the fact. I barely got enough to even try to make them look good. Except for two animated decorations, that event was a bust in my books. I’m already thinking how i can incorporate all sorts of one off decorations and such i can incorporate into this zoo. Yes it’s a bit of a grind but that gives us more time to plan where things go instead of frantically trying level up crafting to get the item we want by getting yet another useless dodad, or having no space to put that needed item. Yep…my creative juices have been all dammed up by the item limits. They bumped the limit by 100…big whoop. I am resorting to just plopping them in the region…and placing dirt around them so I don’t have to weed the flowers. I don’t know if anyone has ever mentioned this before, and if so, I apologize, but what I’d really like to see is the removal of the 24-hour wait to visit friends’ towns. Change it to once a day (based on midnight of your local time), and get rid of the time creep. Gets annoying as these events proceed to start visiting friends at 6am, and due to forgetting or life getting in the way, about a week in, and you can’t visit until 11am. This isn’t just a TSTO thing…it happens in other games as well, where it is just as annoying. As with a previous poster I love the added land I just wish they would add it on the other side of the mountains! We have so many estates and buildings that belong in SH but no where to put them. I’m not even talking the buildings we needed to build for SH which are hidden all over town. I am so glad they added the click to clear your town option. Searching to clear a large town was awful though the having them come to the center point was helpful. I do wish they would go back to clicking buildings in neighboring towns rather than searching for characters. Also It would be great if they would go back to a questline that has dialogue more often not just in the beginning it helps to make the grind worth it. I am near a few zoos the favorite of which is by far the Bronx Zoo. Anyone who loves zoos or animals should check out the animal planet show “The Zoo” it is behind the scenes at the Bronx zoo. You get to see some of the amazing things they do for these animals, how And why and how they construct the habitats the way they do. There is a lot about the history and evolution of the zoos and what animals they keep and why. I have so much land open but I’ve hit the limit day two of the event. It’s annoying to have such a low item limit but release so many things. I love decorating with trees and flowers. Sometimes I think they’d rather just have ploppers that play. I got 300 donuts & Kitene fee on 3 of my logins, but for my main one (over level 200) I have to pay for Kitene – was this because I bought day old donuts? Nope. It was a glitch that they supposedly fixed. Theres no proper questline with a storyline again. All the dialogues are done the first day and then we have two weeks of grinding. And I will start to mention it pretty often (they are rEAding, so why not…) – I need more land on SH side. Its so disproportionate, its not even funny. 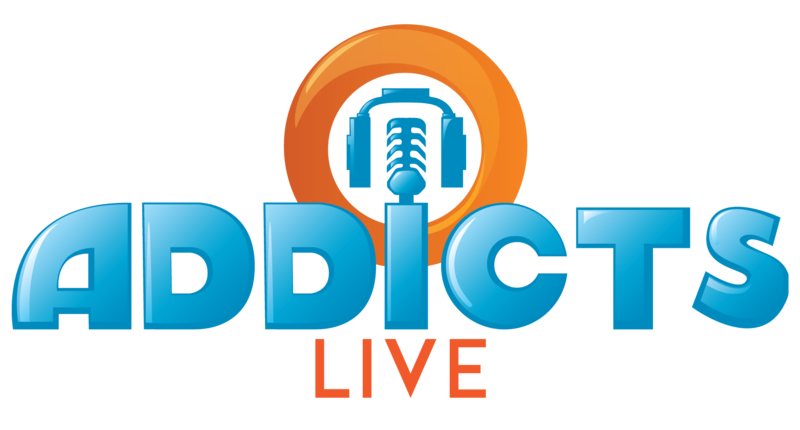 New expansion and they could add new prizes for collecting real estate points. From your keyboard to EA’s ears. I remember the Christmas event where we shot elves out of a cannon and there was one storyline I almost didn’t finish before the end of the act. I miss those days, it really helped keep the events entertain when there was an ongoing story even if it included 24 hour jobs. Hello. 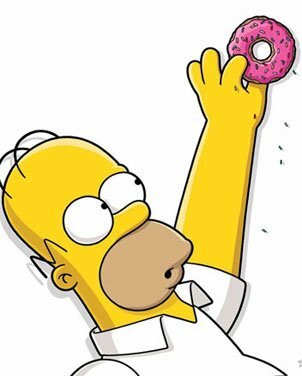 Is the nature of the donuts offer random or do you think it depends on a player’s previous spend? I ask because on my main game (where I occasionally buy donuts if there is a good offer) I’m being offered 300 donuts for £9.99. Whereas, on my two other games (where I have never and will never spend money) I’m being offered 2400 donuts for £19.99. Had I been offered the latter deal on my main game, I would have purchased it straight away. I will not, however, do so for my other games. Similarly, I will not now buy 300 donuts for £9.99 when I could have been offered 2400 donuts for £19.99. It seems wholly bizarre but perhaps that’s just me. I had the 2400 for £20 option and I bought it. Maybe it’s tied to how often you’ve spent out on X account? I’ve only ever bought donuts once before, but it was the boatload and lasted me ages. One would think that the more often you purchase donuts the better an offer would be. To reward loyalty and all that. What EA is doing makes no sense. Ah. Now I see that it was a glitch. Too bad we all didn’t get in on that one. But is it? I’m still being offered the £19.99 for 2,400 on my minor games and the accompanying marketing says “donuts up to 80% off” whereas, in my main game, I still have 300 for £9.99 with a “donuts up to 50% off” sign. It doesn’t sound like a glitch; it sounds like targeted marketing. That is so wrong. I would jump at that offer. i still had the 2400 donuts for $19.99 this morning and didn’t realize it was a glitch so I bought it. Never spent $$ on this game ever but that seemed like a good deal and I was afraid it would go away. i like the item increase a lot and it is good to get more land however it isnt where i want it unless we can move and i havent figured how it does impact on designing. i am so tempted to ove Moes petting zoo but i may just place the pokemon animals their or i KL. I moved mine immediately. Part of it, is that with the item limits, the zoo is going to be pretty scarves in decorations…So, why not? Moe should be in the action anyway. Edinburgh zoo is my nearest, as for item limits does EA give any reason why they are capped, I get the warning at 8700 so is my item limit different?, item limits need to be increased by a huge amount or taken away all together. To EA, can you explain your item limit cap and what’s the possibility of increasing it to give the players room to design and expand. 8700 is the amount they start warning you. Once you reach the limit they cap you and won’t let you put anymore down. It’s ridiculous. Last zoo I went to was the Philly zoo. Nice one and the oldest. The event is ok so far. Good premium characters but so far the animals and attractions could be better. I like the Butterfly Garden, and the Peek-At-Em Park is cute. Nice choice of song, Patric! The New Pornographers are great. I always experience Vu Deja, the feeling I’ve never been there before, even when I have. Living in San Diego has spoiled me on Zoos, especially seeing Joan Embrey on the Tonight Shows all those years. Our animals are impressive but it’s the foliage that wins me over, especially the carnivorous garden. Is this event really “Moe’s Ark”? I know the teaser was, but this event is Springfield Zoo and has nothing to do with Moe anymore, post-teaser. My favourite zoo experience was on my 6 day honeymoon on the Channel Island of Jersey at the zoo which was set up by Gerald Durrell. We spent a whole day at the zoo and took so many photographs we had to go back to the shop twice to get another 36 exposure roll of film! I have never been a fan of locking up animals in cages just for our enjoyment. However, this place is amazing and the work they do not only helps preserve endangered species, it also helps with the education of those living in the animals natural habitat. I suppose this is part of the reason I am loving this event as it is bringing back all those old memories of one of the best times of my life and also the only holiday away we have been on together. This event reminds me of Melbourne Zoo Australia. So animal friendly you can’t see the animals for the vegetation! My husband hurt his back trying to lift our 3 girls to see the top of the gorilla’s head! I’m wondering if EA have some Aussie programmers? The invasive toads are just like cane toads that were imported into Australia a century back to get rid of bugs in the sugar cane crops – But they have no natural predators here & are a plague in warmer areas of Australia. 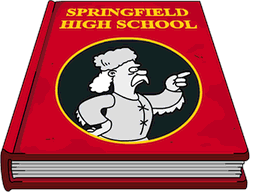 If you need something to do between the slow grinding, I highly recommend Mike Reiss new book– Springfield Confidential– Jokes, Secrets, and Outright Lies from a Lifetime Writing for the Simpsons. Find it at your local library or wherever books are sold. Pretty sure I wrote a post about this two weeks ago…. 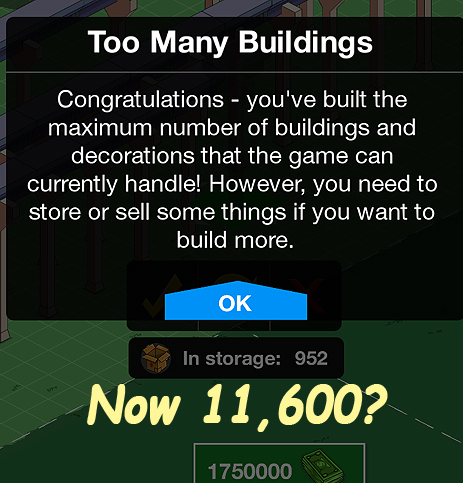 Great post Patric and I agree about the new item limit… woohoo! 100 extra items! (😩) That will probably count for most of the wall pieces for the zoo and fencing… who needs animals in there right?! Oh well, maybe we will just need to let the animals roam free 🦁🐵🐯 In the words of Michael J Fox in BTTF, “Where we’re going we don’t need walls”… or was that roads?! Chaperoned my (now 40yr old), daughter’s kindergarten class to the zoo. I had ONE other child to watch over… THE boy… you know that boy, the problem child 🙄 Needless to say, even though closely watching him, I found myself pulling him back through the bars of the lions cage! I felt bad for the kid, nobody took care of him at home, nobody walked him to school, he had no good examples to follow 😕 He scared the crud out of me, but I didn’t have the heart to yell at him. I hope he turned out ok.
Those are the tough ones. My wife is a teacher…I go in her field trips a lot.. I know that kid..
It’s hard, wish there was more that I could’ve done. I give your wife props, (& all teachers), for the impact they have on children who are hard to handle. I imagine often they are likely the only adult who sees what these kids are going through. I didn’t have a smartphone when Moe’s zoo was done in 2015, so this is new to me. (I now have one and a tablet, finally entered the 21st century!) I’m sort of enjoying it but most of my time is spent waiting for the game to respond. I’ll deal with it, and keep doing the grind, because I want the characters. Planning to spend real money to get Sarah as well. Sorry Patric, grinding is a common use term in video gaming. It’s been around at least since Warcraft started many years ago. It is refreshing to see EA say TSTO events are a grinding game, because that’s what they are. I was hoping the “Pokémon Get” would be included in an event somehow. Glad to see three spots so far: Butterfly Maggie, Peek at Em Park and Homer on the Shop screen. Maybe there’ll be more, but happy with the three. I’ll be dropping green dollars for Maggie. Patric by sharing the following I’m not at all being contentious about your use of the word grind. I’m simply adding to the TSTO slang lexicon history of the word, which you probably well know. It conveyed that the kid identified as such really had to hit the books daily. It implied someone was not altogether quick witted, mainstream cool, bright or quick to learn. I’m sure a lot of smart introverts got saddled with this label. That’s a new one on me! I’ve heard it used to describe an event… as well as a few more tawdry definitions… but never a person. Different regional definitions for sure! UK phrase – as above lots of effort not a lot of inspiration. No worries. Just proves how much I play other games. Like not at all. Hope we get some of Moe’s fake animals again. Wonder if they’ll release the Burns dragon again. I hope so. Happy Friday to all. Quick off topic question. What was the deal with some being offered 2400 donuts for $20? Was that a mistake by EA or was it a deliberate discount extended to some but not all? And what about 300 plus a character or decoration that some got for free? My zoo is pretty much all wall right now. Event is slowly moving forward, like the way grass grows, paint dries, and water freezes. No content, no design. There was a glitch. Now fixed. Sure hope the next update is riddled with similar glitches. I moved the Water Show and Food Needle over from Krustyland to fill in some space. Without any premium items, my zoo would be pretty empty, too. Thank goodness for bonut farming😄.